Watches have evolved a great deal since the early part of the 21stcentury when they first became popular. The first wristwatches were inspired by the military models that made an appearance in the Great War, and the sheer functionality and usefulness of a watch became ever-more apparent as a result. For a long time watches featured complex movements and needed to be wound by hand – many still do and collectors value this type of watch very highly – but sometimes there is a new development that makes things much easier for the wearer. Anyone who is beyond a certain age will undoubtedly remember the ‘digital age’ of the 1960’s; at first digital watches featured red or green, very basic LED screens, and soon were replaced by the more efficient and versatile LCD versions. These clever watches were all the rage for a while, and today are collected by people with an interest in nostalgia, but the traditional, round face with numerals on held sway and, these days, this is the look that is preferred by most wearers. At Creation Watches we stock some models that combine the two, and they prove to be very popular indeed. One area in which the movement has been developed and, in many people’s eyes, improved is in the advancement of automatic watches. For a long time now there have been kinetic action watches available from many manufacturers that are wound by the wearer’s movement; these clever machines offer accuracy and ease of use over a long time, and are affordable and attractive. One of the most advanced of all the developments has come from Citizen, one of the biggest makers of men’s watches and watches for women in the world, and this is the Eco-Drive technology. 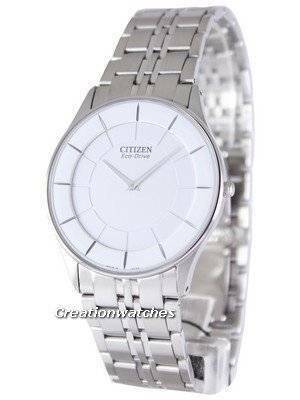 Citizen Eco Drive uses a silicon solar cell that hides behind the face; this collects any form of light and converts it into power, so the battery will never need to be replaced. It is constantly charged by light, giving the wearer an uninterrupted fully charged watch. EcoDrive is not just amazingly efficient, it is also very green and ecologically sound, and the range offered at Creation Watches is a good selection of some of the very best watches on the market today. On another note, these watches are also extremely affordable, very durable and amazingly accurate, so why not have a look at the full range of Citizen Eco-Drive watches today? Previous post Newsletter: Black Friday Sale on Watches with Free Shipping! Next post Newsletter: Cyber Monday Watches Sale is now on!